Home » articles » Discovery Rottnest Island eco-resort opening offer! Nestled behind the dunes of the iconic Pinky Beach, one of the most relaxed and breathtaking coastal locations in Australia, Discovery Rottnest Island is an eco-resort with a difference. 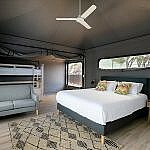 Featuring 83 eco-tents, Discovery Rottnest Island appeals to those who want to feel close to nature however combining all the creature comforts of a hotel or resort. Rottnest Fast Ferries are offering an opening special – book 2 nights or more and receive 20% off your ferry travel. Valid for a limited time. Standard tents are starting from just $101.00 per night. (Terms and Conditions apply, bookings for accommodation staying between April 1st – 30th June. Prices change according to booking seasons). To book now contact our friendly reservations team on reservations@rottnestfastferries.com.au or call our office on 9246 1039.